I swear, Democrats can do it. While Republicans are frantically trying to find some way to get everyone on the same page for their upcoming nominating convention and their front-runner has unfavorables that are on the order of galactic distances, Sanders and Clinton fans are once again trash-talking each other and threatening to stay home in November if their preferred candidate doesn't get the nod. Pathetic. No more shocked GOP jokes about Trump this week. First, Cruz and Kasich are just as dreadful – more so, in some ways, because they have specific plans for the country that aren't made up fresh and new every morning. Second, because just about every Serious Person who's suddenly discovered that the Slo-Mo Exploding Citrus Fruit is a disaster has been spending the last ten months denying responsibility for him being a force, and some of them still are. And no more bird jokes. Done to death, and – as you'll see below – stolen shamelessly. Today's toons were selected by a collegium of superdelegates from the week's offerings at McClatchy DC, Cartoon Movement, Go Comics, Politico's Cartoon Gallery, Daryl Cagle's Political Cartoons, About.com, and other fine sources of toony goodness. p3 Picks of the week: Mike Luckovich, Nick Anderson, Jeff Danziger, Tim Eagan, Dan Wasserman, Joel Pett, Gary Varvel, Brian McFadden, Clay Jones, Signe Wilkinson, Matt Wuerker, and Monte Wolverton. p3 Best of Show: Walt Handlesman. p3 Medal of Dubious Candor (with crossed axes): Darrin Bell. Mark Fiore presents a handy guide: Which terrorist attacks should you pay attention to, and which should you ignore? Tom Tomorrow's Sparky the Penguin faces Earth's most recent Gort! Klaatu barada nikto! moment. You know, just to be safe. Keith Knight looks at the Tarlheel State's bracket situation. It ain't pretty. Reuben Bolling presents the latest edition of Super-Fun-Pak Comix, which includes not only the latest adventure of p3 favorite "Percival Dunwoody, Idiot Time Traveler from 1909," but also the helpful "How to Draw Doug" – which brings to mind yet another instance of art theft on my Facebook feed last week: Someone edited the image of last week's Ann Telnaes' political cartoon (which we commended here), kicking out the text-only panel, bringing the remaining four panels into a square with a radioactive snake-vomit green border around each just wide enough to block out most of Telnaes' signature and copyright info, and then posted it somewhere (my skillz aren't good enough to say where, for sure) without attribution. Someone on my friends list, with whom I'm not actually acquainted, reposted it. I left a comment pointing out the original artist, noting that some but not all of her signature was deliberately blotted out, and providing a link to the original post. A commenter or two thanked me for directing me to Telnaes' page, but no one seemed to get the notion that this was in any way wrong. Folks, it's the internet: it only takes a fraction of a second to do an image search with Google or Tin Eye or the like, and find the artist, and another few seconds to provide a link to give proper credit. Red Meat's Bug-Eyed Earl shares an Easter Season lesson. Thirty-six years ago, the Buggles marked the birth of MTV with "Video Killed the Radio Star." This week, Comic Strip of the Day observes that the internet killed April Fools Day jokes (or, alternatively, that a hefty chunk of social media has extended the basics of April Fools Day jokes into a 24/7/365 enterprise, making the day irrelevant). Good. I'm gonna dig up wots of gold – V for Victory! And that's only one of the wartime gags tossed into "The Wacky Wabbit," directed in 1942 by Robert Clampett (with uncredited voice work by Portland's Own Mel Blanc as Bugs Bunny and Arthur Q. Bryan as Elmer Fudd). This was one of the earliest Bugs cartoons; they'd pretty settled on his look and style, but Elmer was due to go through some more ch-ch-changes as his foil. Ex-Oregonian Jack Ohman calculates the creep factor. Documented Ex-Oregonian Jen Sorensen also casts a light on the continuing downward spiral of North Carolina – a state that was making serious 21st century progress until only a few years ago – and reminds me of a story often told by Official p3 Muse Molly Ivins, the punchline of which was: There are some things that won't hurt you, but they'll scare you so bad you'll hurt yourself. Matt Bors presents an alternate universe in which Donald Trump would never have had to go to a military academy just because he was a brattish disciplinary problem. 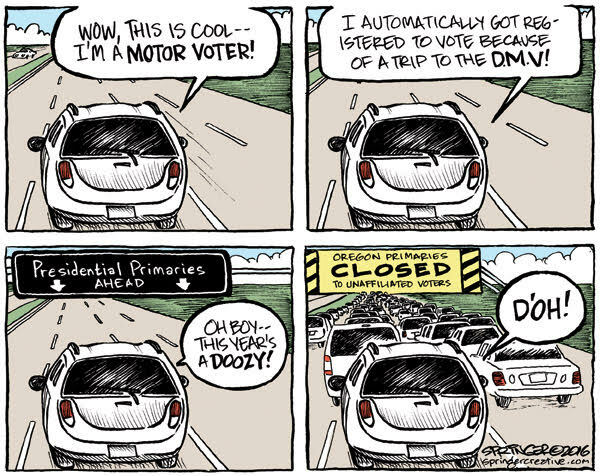 Jesse Springer points to a glitch in Oregon's otherwise admirable motor-voter law. It may get fixed eventually, and it's simple to go online and solve the problem individually, but between now and the Oregon primary, it's likely to get some Oregonians' dander up.